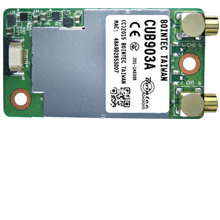 Bointec CUB903A is a WLAN module supporting IEEE 802.11 a/b/g/n standard by the USB 2.0 interface. 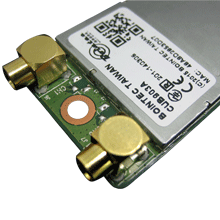 A small form factor WLAN module engineered for the wireless connectivity.CUB903A possesses the dual band features and 2X2 MIMO technology (2T2R) can achieve the max throughput of 300Mbps based on its comprehensive modulation technique. 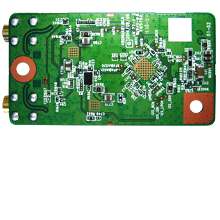 Bointec CUB903A support DSSS (DBPSK,DQPSK,CCK), OFDM (BPSK,QPSK,16QAM,64QAM) according to legacy of IEEE 802.11 a/b/g.As for legacy of IEEE 802.11n, it can support OFDM and the data rates of MCS0~MCS15 based on HT20 and HT40 modes.Bointec CUB903A is competent solutions in critical environments. The operation temperature is -10~60 degree C.With 2 SMA connector, CUB903A is good for industrial applications WIFI connectivity demand. The transmitted center frequency tolerance shall be ±20 ppm maximum.